If you were not able to make it to the Nursery workers’ meeting on the first of July, then we can update you a little on what’s happening at church. There are some helpful guidelines for you to follow such as showing up early for your work period and separating the infants and toddlers (so our walkers don’t step over our crawlers). The three-year-olds and above have been moved to another area of the church building and the little ones have more room. There are also holders provided for shoes and a changing table outside of the main rooms so that you can handle diaper changes a lot better. This station is equipped and open to mothers who are caring for their own babies as well. It is easier for others to access it this way and very close to the bathroom if a quick wash is needed. Many sanitizing tools are available right at the changing table and there are plastic bags for better diaper disposing. Please get a copy of the nursery workers duties from Sister Marie. You can also view this list in the nursery room. If you haven’t already, please fill out an About Me Sheet that tells important information about your child. It helps nursery workers keep track of age, allergies, special requests, and other information vital to helping you and your child. Thank you Sister Marie for all your hard work. Thank you also to all those helping out in our church to provide care for our children. Lastly, if you would like to volunteer (especially during the month of July) to be a temporary helper, please let Sister Marie know. Also, the women were discussing that some people may be easily called from church if there should be a need that arises if a baby needs to be held most, if not all, of the church period. Let Sister Marie know if you would be available for this “on call” service. Are any of these things yours? We have accumulated some items and have a new spot in the foyer called “Unclaimed Items.” Please free this area and help others locate their lost goods by seeing if you can help us track the owner. Thank you! Stay informed about events at Family Baptist Church by getting your copy of the monthly schedule in the foyer. Birthdays are included as well as the nursery workers’ schedule. 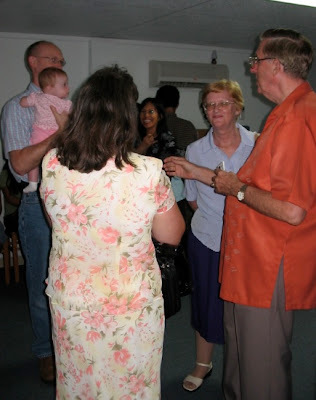 Find out when Pastor Jay returns from India and when Miss Carman arrives on Guam. There are many lists and sign up sheets at the back table at the foyer. Please don’t miss out on being a blessing to others by finding out more details there. You can also pick up free material to use or give away. Many of our members are away, including our pastor. Please continue to pray for all those traveling and for each other. It was precious to see how the church responded to Brandy’s accident as soon as we got in touch with each other. The Thorpes have been such an encouragement to us and we are thankful that we are able to be a blessing to them during this time. We really enjoyed having Brother Douglas and his wife Helen Worley with us this past week. It was a blessing to be able to hear of their life’s journey for the Lord in England, Singapore, and now Dumaguete in the Philippines. Not only did he teach us but also encouraged us to be grateful for the church that we have. He told us that we should thank the Lord everyday for such a special church (Family Baptist Church of Guam) and it’s true! Our family has definitely reaped many blessings from our church since we were first visitors about three years ago. We have enjoyed being members and working together for the glory of God. I asked Brother Worley later why he would say such special things about our church (having only observed us for a short period of time) and he said that he’s been to many churches over his lifetime and this is one church that he knows he and his wife would enjoy being a part of and fit right in. How encouraging! Brother Worley also got to know our Pastor through other members and told us that he heard that we have probably “the hardest pastor in Guam.” He continued to praise our pastor’s vision and encouraged us to keep striving towards getting a bigger building that can house our growing congregation. Please continue to pray for this faithful family. Please be in prayer for Pastor Jay as he’s away as well as those he will be ministering to. We will be blessed with a guest speaker, Doug Worley, on Wednesday, July 4th, and Sunday, July 8th. • FBCS is currently enrolling students from grades K5 – 10th for school year 2007-2008. Seating is limited. • Parent orientation will be held on July 28th from 8AM-12PM and is mandatory for parents of students. • Monitor training: If you’d like to be able to help in the FBC School, you mast attend one of two monitor training sessions scheduled for July 29th and August 5th from 3PM – 4:30PM. 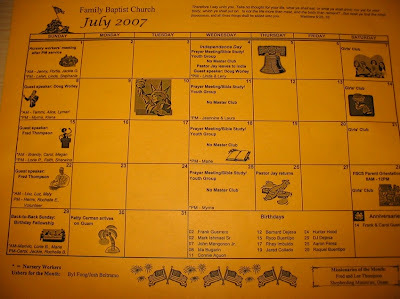 Birthdays and anniversaries for the month of July will be celebrated on July 29th after the morning worship service. There will be no Master Club in July. FBC will hold its quarterly business meeting on Sunday, July 15th, after the evening service. All members are urged to attend. Please bring light refreshments. The directory is currently being updated. Please see sis. Jackie for changes to your section of the directory. • Guest speaker: Fred Thompson (our missionary of the month) – July 15th & July 22nd.